What Facebook information do we access? Read more about What Facebook information do we access? As a result of these changes, the profile boxes and profile tabs will no longer be available from TomorrowsPro. These types of integrations worked great because you could show your stats to others without having them sign up for another application. If there was a way to build your stats into Facebook so your friends could see them without connecting to TomorrowsPro, we would have built it. Since that doesn't exist, we have enhanced the way the TomorrowsPro web site uses Facebook and built stat sharing with your Facebook friends into the site. 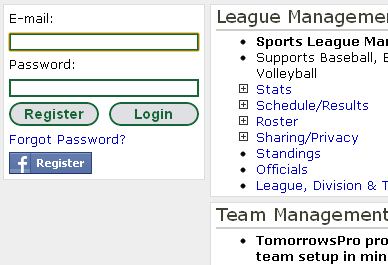 The changes that were made were enhancements to the Login/Registration process and the "Friends" page. Whether you are a new member wishing to use your Facebook credentials to join TomorrowsPro or you are an existing member who would like to join their Facebook account to their TomorrowsPro account to enabled Facebook sharing, the process is the same. Navigate to TomorrowsPro.com in your browser and click the Facebook Login button. A Facebook login window will appear. 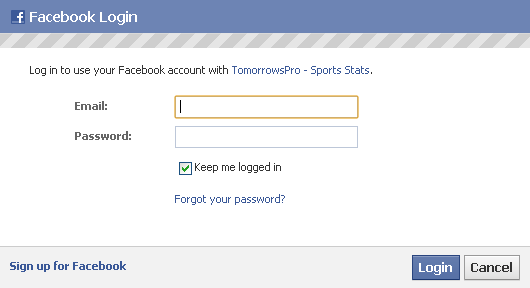 Type in your Facebook credentials and click "Login"
If you have already connected your Facebook Account to your TomorrowsPro account, you will be logged into TomorrowsPro at this point. If you haven't connected your accounts yet, you will notice that the Facebook login button has become a Facebook Register button. Click on this button. 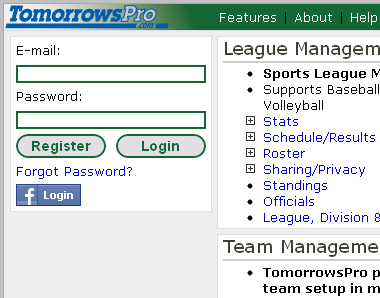 The friends page has been around on TomorrowsPro for a while, but now we have improved it. Since TomorrowsPro doesn't allow you to connect or be friends with other members of TomorrowsPro, we have setup a way to share stats with your Facebook friends only. If these two conditions are met and you are currently logged into TomorrowsPro with your Facebook credentials, you will see which friends have updated their stats recently as well as all of the stats they are sharing with their friends. Many members have started asking how they can get a TomorrowsPro.com e-mail/password login. When you register via Facebook Connect it is incredibly easy because you don't have to enter any registration information. The problem is that without that additional information such as e-mail and a password, you must be logged into Facebook to use the site. 1. 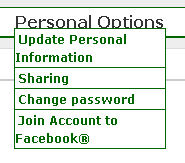 Navigate to "Personal Options" -> "Update User Information"
3. Navigate to "Personal Options" -> "Change Password"
5. At this point you have successfully setup your TomorrowsPro login. 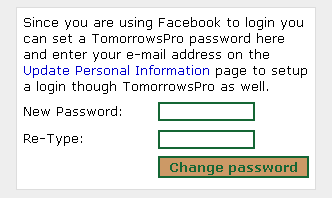 Log out of TomorrowsPro and Facebook, then login with your TomorrowsPro login. If you run into any issues, contact support with the e-mail address you used and your Facebook ID Number. This post is outdated: Facebook has deprecated Facebook Profile Tabs. Please see Updates to Facebook Integration for the latest Facebook integration information. 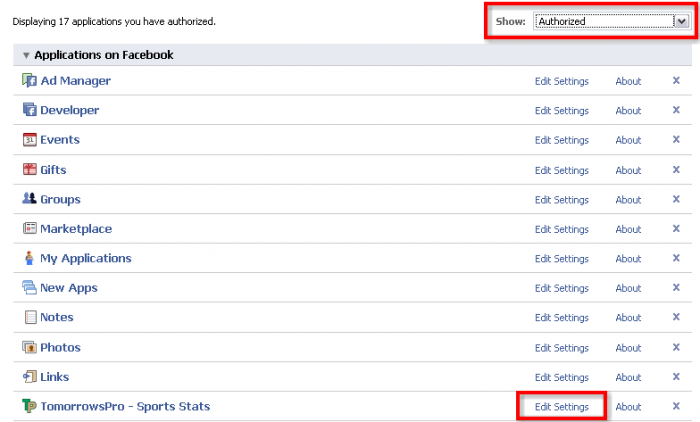 Facebook has entered a bug fix and the links in your TomorrowsPro "Sports Stats" tabs are working again as expected. Facebook is aware that the links in all application tabs are not working as they should. Hopefully they can fix it soon...The primary sub-sport of your most recent stats should still show when you click on the tab in your Facebook Profile. I will update the blog with any news on this. This post is outdated: Profile Boxes have been deprecated by Facebook. Please see Updates to Facebook Integration for the latest Facebook integration information. Since we implemented Facebook Connect we have seen a greater number of people adding the application to their profile. The problem with Facebook Connect is that it doesn't work the same as adding an application within Facebook from the Application Directory. The difference is that a profile box is not automatically added to your profile when you connect, but it is when you add the Application. Since that is one of the best features available to you once you "Connect" your TomorrowsPro account to Facebook, here are some instructions on how to add your stats to your profile after you "Connect." 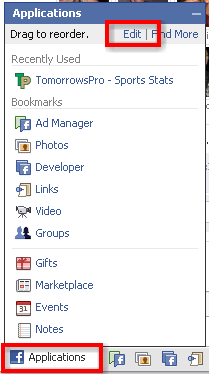 Log into Facebook and click on "Applications" in the bottom left hand corner of your browser window. Click "Edit" on the new window that appears. Find the dropdown menu on the "Edit" page and choose "Authorized". Click "Edit Settings" next to the "TomorrowsPro - Sports Stats" application. Click on the "Profile" tab. Under "Box", click "Add" and make sure you set your privacy settings so the right people can see your stats. Congratulations! You've added your stats to your profile. FB Friend's stats are now listed on their own page so seeing their updates is now much easier.